2. Fry the mustard seeds, curry leaves and green chillies for a few seconds. 3. Add the groundnuts, mango, apple and coconut. 4. Mix well and add salt. 5. Stir one more time and remove from heat. 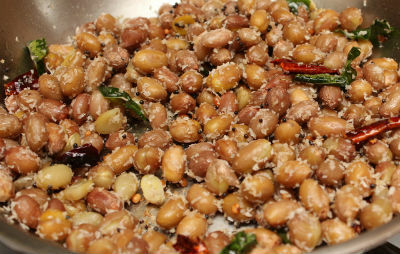 Feel free to comment or share your thoughts on this Groundnut Fruit Sundal Recipe from Awesome Cuisine.